I chose to use dried kasturi methi leaves because of their amazing medicinal properties. It is known for its anti-cancer properties, used popularly for its medicinal treatment of diabetes for lowering blood sugar levels, helps with acidity, skin inflammation, and to an extent in reducing unhealthy blood cholesterol levels. The most common health problems prevalent in the 21st century. 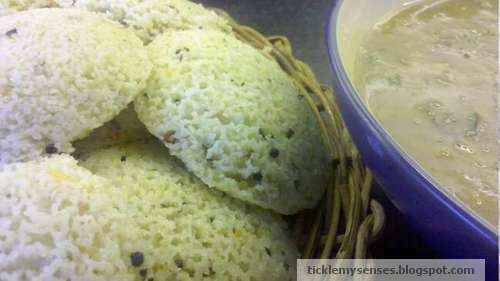 I have tried several recipes for rava idlis , and have now developed my own ratio for rava, curd and water that makes soft, light and tasty rava idlis which I am very pleased with. When making these rava idlis ensure that the same cup is used to measure the rava, curd and water. Additional ghee for greasing idli moulds. 1. In a wide base pan heat 2 tsps oil and 1/2 tsp ghee, when hot add mustard seeds, once it splutters add chopped curry leaves, naked urad dal, green chillies minced, fry for a minute or till urad dal browns lightly. 2. Add minced carrots, and cashewnuts roughly chopped, fry for 2 minutes or till cashews slightly colours, add crushed dried kasturi methi, fry till methi aroma arises. 3. Now add rava and fry well till rava lightly browns or till aroma of fried rava arises ( this step is very important to ensure idli does not turn out sticky). 4. Take vessel with rava off heat and leave aside for 10 minutes to completely cool, touch rava with fingers to ensure it is cold before adding curds ( this step is very important to ensure that rava does not get lumpy on addition of curds). 5. In mean time, in a large bowl whip curds till smooth add salt to taste. Better to add a pinch of salt more to ensure idli's are well seasoned. Add hing and ginger paste to curds and mix well. 6. Once rava has cooled completely, add curds a cup at a time and mix well to ensure a smooth batter is obtained. Add a cup of water to get a lighter idli pouring consistency. If batter is too thick idli will be hard. Make sure batter easily drops off the spoon. Leave aside to rest for 10-15 minutes. 7. In the mean time boil kettle of water, pour into tandoor/ steamer or pressure cooker. Close lid. Once steam starts coming through get the idli batter ready. 8. Grease the idli moulds well with ghee. 9. In a small bowl take baking soda, add juice of half a lemon, the mixture will start bubbling. 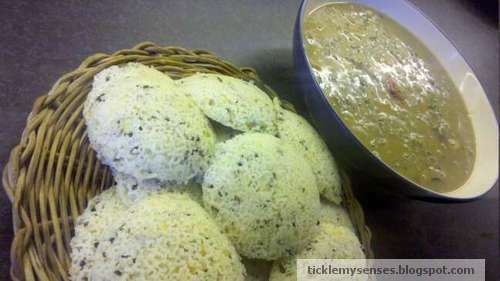 Immediately pour into the prepared idli batter, mix well and ladle the batter into the greased idli moulds. 10. Steam for 10-12 mins or till idli batter does not stick at all to finger when touched on the surface. 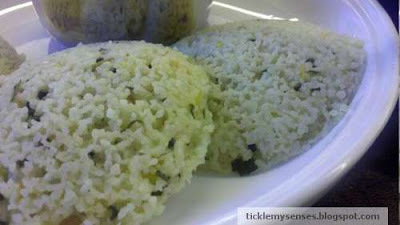 Make sure idli's are cooked before taking out of steamer. You can also use a toothpick to ensure the idlis are cooked, batter should not stick to toothpick when cooked. 11. Then take out idli rack from steamer, lay trays flat and allow to cool down for a couple of minutes.
. Use the edge of a knife to remove rava idlis from moulds. Yummy methi rava idlis is ready. Serve hot with your favourite chutney, sambhar or idli podi.